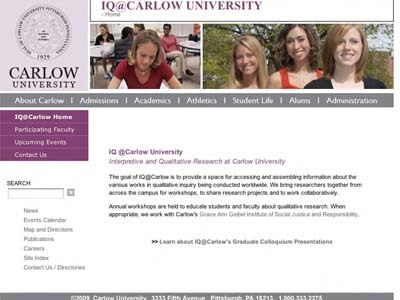 The goal of IQ@Carlow is to provide a space for accessing and assembling information about the various works in qualitative inquiry being conducted worldwide. Carlow is a small, Catholic, women’s centered university especially focused on issues of justice and women. We bring researchers together from across the campus for workshops, to share research projects and to work collaboratively. Annual workshops are held to educate students and faculty about qualitative research. When appropriate, we work with the Grace Ann Geibel Institute of Social Justice and Responsibility housed on Carlow’s campus.